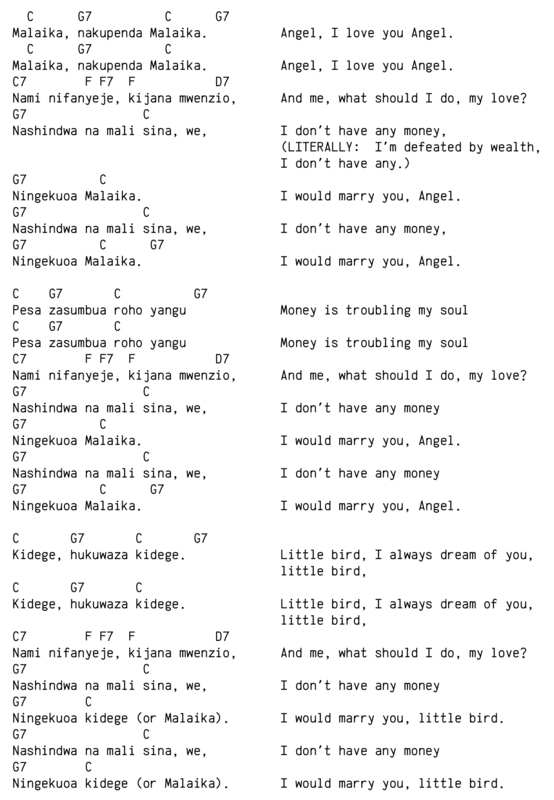 Lyrics and chords to "Malaika." There are many versions of the song Malaika, all with slight variations. I sing a simple version accompanied by ukulele. It's a great song for that instrument. The Wikipedia article on the song discusses authorship and other matters. Here is an image of the lyrics and chords I use. Kijana means a youth. Mwenzio or mwenzi is a more complex term. It can be used for spouse or partner. However, the root is from "enza" (to cause to go), so the word means "companion", as in on a journey.